Getting around Srinagar is much the same as getting around many other parts of India: your primary option is most likely going to be the autorickshaw, more commonly referred to as an “auto” in the country. Autorickshaws abound in Srinagar, although you should be mindful of the fact that there are quite a few other options available if you would prefer to go about another way. If you do plan to take the autorickshaws, be warned that many of the drivers may not be too good at English, making complex direction-giving or conversations a bit difficult. Be warned too that you should negotiate the price before getting into the auto instead of at the conclusion of the ride: to get a good basis for your prices, try talking to the concierge or some other member of your hotel’s staff to get a price quote of the place to which you are headed, and then use that as a basis for your negotiations with the auto driver. If rickshaws are not exactly your speed, then you might consider calling for a cab or having your hotel call one for you. It is also popular here to hire a personal car (it typically comes with a chauffeur), which can be a worthwhile investment for your tour of the city, especially as it at least assures you of higher security during your travels around Srinagar: not having to get into a moving vehicle operated by a random driver each time you get out of the hotel brings down the chances of kidnapping, after all. Then there are the minibuses, which have been getting more and more popular in the area. These buses are fairly well-kept and can seat about 19 or 20 persons each, making them ideal for tour groups. You may rent your own minibus, as a matter of fact, if you are travelling with a large enough band all interested in visiting the same places. Otherwise, the smartest thing would be to take a cab or an auto to keep your costs down while you are getting around Srinagar on land. Merely because this is the Kashmir does not mean there is no such thing as getting around Srinagar over the waters. As a matter of fact, many people in the city actually go about in boats. This is due to the location of two major bodies of water near the city. 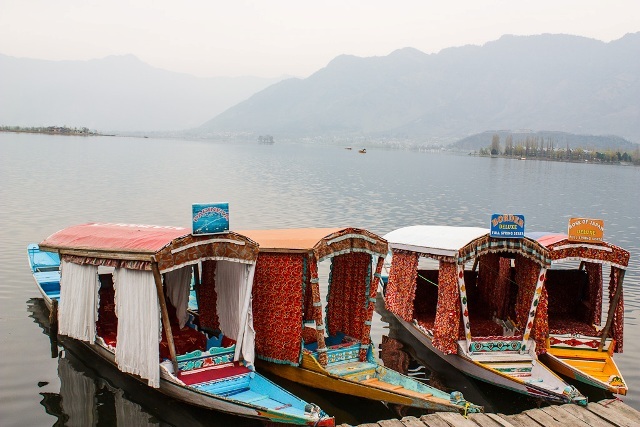 These are Dal Lake and the Jhelum River, both of which are more or less tourist attractions in their own right and both of which happen to have quite a number of boating companies and guides frequenting them. It is not uncommon to pass by the Jhelum, for instance, and see a fleet’s worth of boats spread all about its massive length, touring the banks of the lovely river. Much the same sight shall greet tourists coming to Dal Lake. It is more typical for people to use boats for cruising than for strict “getting around” purposes, however, although you may certainly use the boats for shortcuts across the lake or river if needed.